Archive for the ‘WPF’ Category. In the past, I once wrote an article about WPF replacement options for an animated gif. Recently I needed to use this again, but I wanted a control that was more MVVM friendly. I also didn’t want to have to add a bunch of XAML every time I used it. This might sound crazy, but I wanted a reusable object. (Crazy right? 😉 Anyway, this led me to create a custom control that inherits from Image called SpinningImage. So here is what I wanted. An Image with a simple bool dependency property that makes the image spin when true and stop spinning when false. Now to use this in XAML, it is quite simple. Feel free to enhance it. It probably would be nice to enhance this and make dependency properties for Storyboard variables such as Duration. It might even be a good idea to move the StoryBoard to code and eliminate the XAML in the custom control. Either way, this control is easy to stick into a library and use. So I wanted a TextBox that trims automatically. At first I played with the idea of a converter, but that just didn’t work out. Try using a trim converter with UpdateSourceTrigger=PropertyChanged and you will see what I mean. Yes, it seems you cannot even type a space. I need the trimming to occur after losing focus. After thinking about it, a converter was the wrong method anyway. If I want a TextBox that always trims when it loses focus, why not just make one by inheriting from TextBox and adding a method to the LostFocus event. So I did. Remember, it is the simple solutions that are best. Ok, I was quite annoyed when I could not bind to an ObservableCollection and be able to add and remove rows in a DataGrid. I just wanted a list of strings to display and to easily update them. I was sad that this does’t exist by default, so I created one. This is actually a UserControl that hosts a ListBox, but it works just like a ListBox. I can add to and delete from a bound ObservableCollection. I wanted it to support pressing delete. Right-clicking and choosing delete. Typing in a new item at the bottom and clicking Add. Or click enter after typing. I wanted it to work with List too in that if an item is added from the UI, the UI and the List are updated and I got that to work. However, if the List is updated in code and not via the ui, the UI will not know about this change. That is what ObservableObject is for. And here is how you use it just like you would a ListBox. For those who wonder why I used code-behind and question if this is breaking MVVM, it is not. I am creating a reusable control here. When creating a control, the goal is to have everything in one object. Everything in the code behind is related to the UI code or uses an interface. You can use this and bind to it in MVVM just like you would a ListBox. For this example, lets think of a stop light during the traffic of your morning commute. There will be three images of a stop light. Each image will have either the red, yellow, or green light on. Note: This is for both Developers and Designers. It is for designers because they can do all of this without code. It is for Developers because they need to know to not go reinvent the wheel and spend their time writing code to do this. You can do this in either Visual Studio or Expression Blend. For this example, we will use Expression Blend 4. Note: I named this project SwitchImagesWithVisualStates. Right-click on your project and choose Add new folder. Open your file system and copy or drag your images to this new folder in Expression Blend. Note: If you copy the images using the windows file system, you may have to add the files to the project. We are going to have a simple view for this example with the images on the left and buttons on the right. Add a column to the default Grid, so there are two columns. Make the columns 3* and 1*. This will make the left column 75% and the right column 25% of the Grid size. Add all thee images to the left column. Remove any margins, heights or widths, and vertical or horizontal alignments from the images. Note: This is important so the images are always in the same place. Note: This assumes that all three of your images are identically sized and properly placed. Name each Image: ImageRedLight, ImageYellowLight, ImageGreenLight. Add a StackPanel to the right column. Remove any margins, heights or widths, and vertical or horizontal alignments from the StackPanel. Click to select the StackPanel in the Objects and Timeline box. Add three buttons to the StackPanel in the right column. Remove any margins, heights or widths, and vertical or horizontal alignments from the buttons. Name each button: ButtonRedLight, ButtonYellowLight, ButtonGreenLight. Your View should now look like this in the Expresion Blend designer. In Expression Studio, click on the States tab. Note: Sometimes the States tab is hard to find. On the top right of the States tab, click icon that has a + sign to add a VisualStateGroup. Note: I named mine VisualStateGroupTrafficLights. Under the VisualStateGroup you now have another icon with a + sign (the Add state icon) that add a VisualState to the VisualStateGroup. Click it three times to add three VisualStates. Name the VisualStates: VisualStateRedLight, VisualStateYellowLight, VisualStateGreenLight. You will see a red outline around the designer and the words: VisualStateRedLight state recording is on. 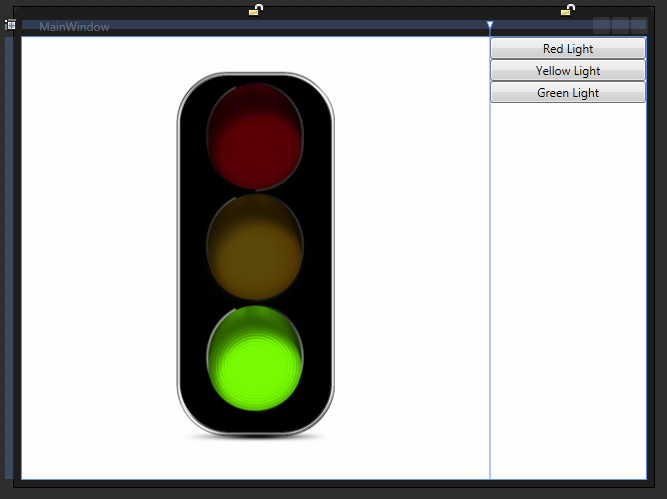 In the Objects and Timeline tab, press and hold control and click to select both ImageYellowLight and ImageGreenLight. Change the visibility of the images to Hidden. You will see a red outline around the designer and the words: VisualStateYellowLight state recording is on. In the Objects and Timeline tab, press and hold control and click to select both ImageRedLight and ImageGreenLight. You will see a red outline around the designer and the words: VisualStateGreenLight state recording is on. In the Objects and Timeline tab, press and hold control and click to select both ImageRedLight and ImageYellowLight. In Assets, search for GoToStateAction. Click and drag the GoToStateAction and drop it in the designer over the ButtonRedLight. Set the StateName to VisualStateRedLight. Click and drag the GoToStateAction and drop it in the designer over the ButtonYellowLight. Set the StateName to VisualStateYellowLight. Click and drag the GoToStateAction and drop it in the designer over the ButtonGreenLight. Set the StateName to VisualStateGreenLight. That is it. You have now written an application that switches the image. Here is your final Xaml. There is a lot more to learn. We didn’t even touch Transition or Easing methods. We didn’t discuss how to hook this up into a full application, or possible an MVVM application.